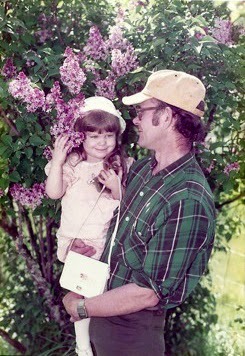 Enchanted Visions Artist Jenny Heidewald as a child with her beloved father. Who is “Jenny Heidewald”? Tell us a little about yourself. In elementary school years, I usually drew on my math scrap paper; there were a lot of princesses, and horses. A big influence was Mary Blair’s 1950 “Walt Disney’s Cinderella” Big Golden Book, wow, that dress! It’s how I learned to draw the swirly bottoms of dresses. I preferred that book version to the animated Disney version of Cinderella, and severely disagreed with their Snow White, “Princesses should have LONG hair!” I didn’t actually see those movies until a couple years ago; just saw the illustrations of the character. In my teen years, Mom bought me a book “Draw Real People” and I wandered into the world of graphite shading. From graphite, my next step was colored pencil, to watercolor pencils, and micron pens. I will be forever grateful to the wonderful artist, and sister-in-law via my husband, Charon Henning for introducing me to those, and suggesting that I start using colored pencils. I graduated to using just watercolor with multi colored micron pen lines. I never thought I would like watercolor so much, I’d formed a low opinion of watercolor when I was little due to those sets with the silly plastic brush; also, when one is little one over uses water, so wrinkly messes result. While they are my favorite, I don’t restrict myself to watercolor and micron pen; I’ve tried many different mediums, as it is fun to play. 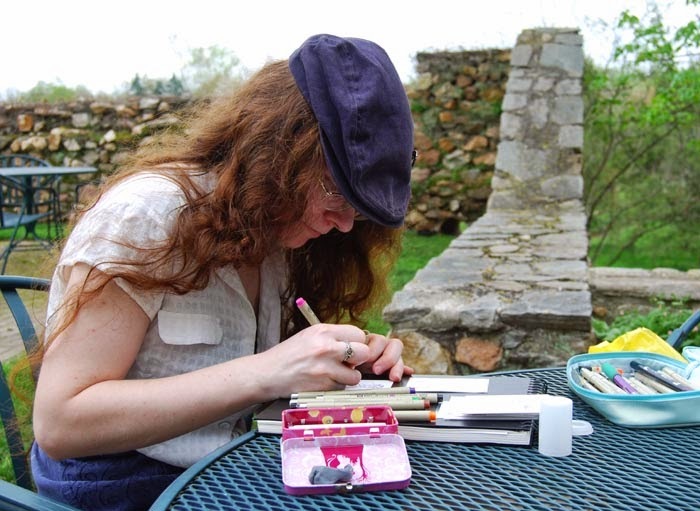 I joined Elfwood in 1999, and from there met Ellen Million (of Ellen Million Graphics); through her awesome projects I’ve come far as an artist, and gained number of friends, Ellen included. EMG’s Portrait Adoption in particular is great; when we frequented the message boards, I received many fabulous tips from fellow artists. I’ve been involved with several coloring books Ellen has produced; it really works my inking and layout skills, and trying to think of clever, offbeat takes on subjects. I also enjoy participating in EMG’s Sketchfest, which is like Enchanted Visions, except, instead of one theme a month; it is a 48-hour online event. Participants post prompts and artists draw inspiration from them; everyone is welcome and it is free to participate. I discovered ACEO size cards; I started out drawing small because I thought the cover artists for books I read really did paint that tiny, and now I draw little because it is fast and fun. Sketchfest–it’s addictive! 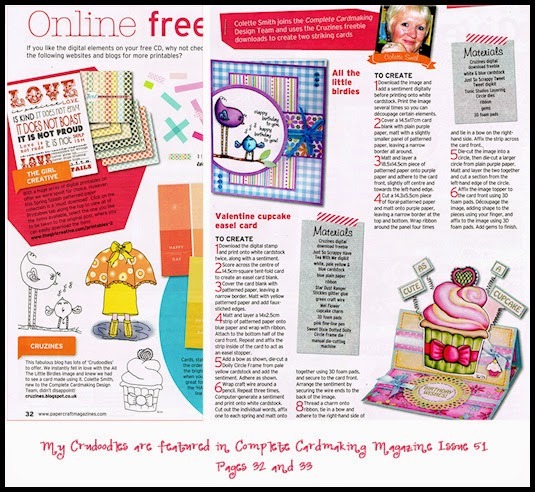 I also participated in EMG-Zine, writing articles and drawing how-tutorials about the themes. I usually ran a bit late because I am meticulous with my research, I want to be the most accurate I can be! I learned a lot of interesting things that I wouldn’t have otherwise, and am obsessed with a couple things that I wasn’t before, like owls. In other writing projects, I have participated in Na-No-Wri-Mo a few years, but I am still not done with that novel. I am a little afraid to reread it, there were a lot of half-asleep writing jags getting to my word goal. I admire too many artists to list, but would be remiss if I didn’t mention how Larry Elmore’s work has inspired me over the years; his inking and details are fabulous. Wendy Pini’s “Elfquest” influenced me, until I rebelled and decided to draw characters that would NOT look like hers; I want my art recognized for its own merit, not, “looks like ‘Elfquest‘.” It took several years, but I feel I have matured into my own style, though I still draw elf ears the Elfquest style, if smaller–they make sense! I like to try new styles, just to see if I can. I get frustrated when I feel like my style still comes out when I am trying to be completely different. I wish I could do those awesome realistic type drawings and paintings fast, but I rather lack the patience I had in my teen years; back then I would sit for hours working on filling a whole page with a totally graphite shaded scene. Not that I couldn’t do one eventually, just in my striving for perfectionism it would take me so long. In the meantime I look at awesome, galvanizing art, and do my own thing; after all, I am the only one with my style, and someone has to let it come to life! Currently I reside in Maryland, USA with my dear husband of ten years, Alexander D. Mitchell IV. He is a writer, photographer, and editor, who has suffered through many, many EMG-Zine articles of mine, for which I am eternally grateful. I came across Enchanted Visions through Coriander Shea when she was first running it, then I was following on Facebook. I hung around so much I kind of got “absorbed”. “Wait, you mean ME?” I was honored by the invitation; I hadn’t thought that most of my art, compared to other EV artists‘, would be considered “completed”. “Crimson Wings” I try to combine projects if I can, this was for a brother’s birthday card. I associate him with cats and red, so I ended up with a steampunk hang gliding cat! I think this is my most clever take on a theme to date, and it makes me smile when I look at it. “Forgotten Summer” This is one of my favorite pieces, and that is even after the braving the evils of perspective! I was working on an article for EMG-zine, “Towers”; when I think of towers, I think of Rapunzel, my favorite princess even before “Tangled”. I got the picture in my head quite quickly, but she needed a back-story. 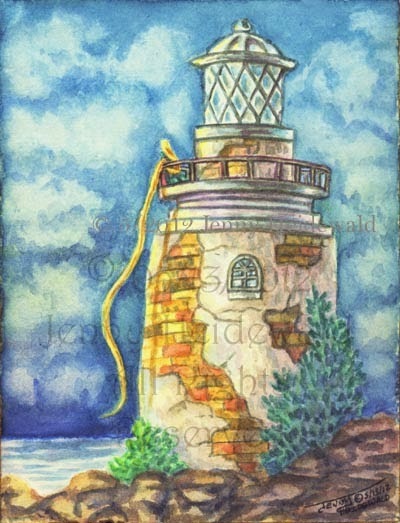 I started pondering, “Ok, this summer she got to go on a vacation, but no one remembers she’d gone; they are obsessed with the scandalous drama part of her life, thus ‘forgotten summer‘.” I decided to make the tower a lighthouse because my husband has taken many beautiful photos of lighthouses. “Darkness Falls” Beware, when darkness falls, the dragons rise! This was a 2013 birthday card for my Dad. I had a bunch of watercolor paper that had print on the back, so I got the idea of doing silhouettes, painting it with a gradient wash, and then gluing the paper to black cards. I really loved working with the gradient colors, and the dirigible ship was a challenge; my Dad loved tall ships, so I wanted some sort of ship. Sadly, this was his last birthday celebrated here on earth, he passed away this past December. Rest in peace, John D. Heidewald, we love and miss you and your quiet ways. I haven’t yet, mainly due to not finishing pieces in time. I did sell one online last year through a different outlet, “Circe”, whom I drew for an ACEO a day challenge. Yes! One thing I have challenged myself with is trying to think of things completely off the wall and unexpected for the themes. It helps to see what lovely art my fellow artists made, gets the creative juices going. Unfortunately, the research and thinking required for “off the wall” tends to take a long time for me; My muse is slow, which is one reason why I am so behind. Recipe for muse’s soup “Let it Stew”: throw all the little bits of inspiration in there, think and think and think, and hope what comes out is good! I will admit that there are times where I just drew what I wanted for the theme, and to heck with the unexpected. My mindset of “It has to be just right and COOL, too” gets exhausting, so it is nice to let loose now and again, art should be fun. Is your art hanging or displayed in your home. If so, where and how? If not, why not? What type of art (besides your own) hangs on your walls? There are ACEOs scattered about the apartment, some are mine that my husband prompted through Sketchfest that he liked, some are pieces I couldn’t bear to part with. I don’t have too much wall space because there are many bookshelves, does a chicken calendar count? Other than that, I have some Mucha art taped to the side of a bookcase. My work “Forgotten Summer” is by my bed, along with “Footprints in the Sand” poem/art, a photo of Dad, a rose drawn by one of my brothers in remembrance of our Dad, and lots of numbats, mine and pieces I have purchased. Numbats are a severely endangered Australian marsupial, and look like a cross between a squirrel and a zebra. They are just SO charmingly cute, and I am obsessed with them. One piece of art dear to my husband and I is a sweet felted numbat made by his sister, Betsy Mitchell-Henning. She made it from alpaca fleece from my AZ family’s herd. Our family was devasted again when Betsy passed away suddenly this January; a loving and inspiring person, she is greatly missed. It had been a hard year for me to make art. Currently my main workspace is my half of the bedroom, not the Ladew Gardens pictured with this interview, pens travel nicely! My home space consists of a wooden stool, a small narrow table with a shelf under the top that holds my painting supplies, the bed, and lots of bookshelves for my reference materials. When I am actually working on art it looks like an explosion happened, I end up with books and art supplies all over my work area. I also use the living room computer for research, and Photoshop dealies. When I first moved to Baltimore I lived in a house rather than an apartment, and I had my own room for my stuff. That was such a luxury, I really miss being able to leave stuff out so I won’t have to unpack it when I want to work, and, conversely, having to pack it up when I want to go to bed! My dream workspace would be having my own room again so I can move and leave things out, and have lots more bookshelves. I would love to live in the mountains, or countryside; I love being in the relative quiet of nature (unless it involves mosquitoes or ticks), and being able to look out over the beauty of it. Thank you so much Jenny for this wonderful look into your creative process, your art and you. 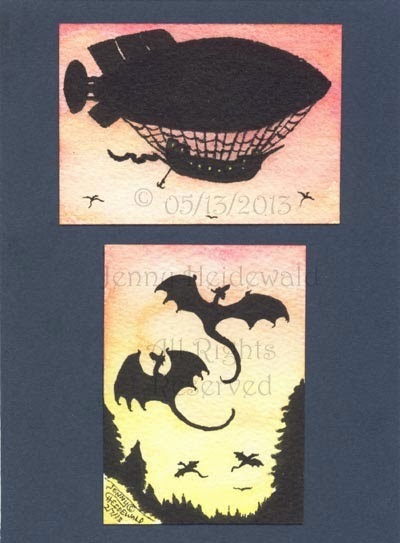 Please visit ENCHANTED VISIONS to see more of Jenny’s art and what she has created for the latest theme. Posted in artist feature, artist interview, Enchanted Visions, Friday Art Feature and tagged fantasy art, Jenny Heidewald. Aww, thank you so much, Mayumi! It really does take time to get the obvious ones to make room for the odder ones. I've been thinking about "The Brew", to try and get one done in time, but that one isn't really lending itself to much! 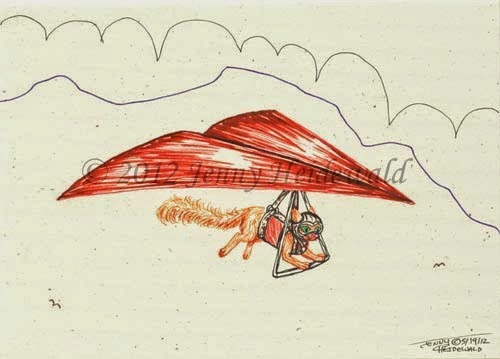 Great interview/art/artist, Jenny! I'm with you on Snow White/Long Hair Required; love nature/ticks & mosquitos not so much. My sympathies to you & your family at the loss of your dear SIL Betsy.